Furniture Removal Spain - Will Your Electrical Goods Work In Spain? Furniture removal Spain has many dos and don�ts associated with it, and it is important to do your research on certain items prior to bringing them into Spain. Your professional removals company will be able to advise you to some extent. What are some factors that you may need to check before you bring certain items with you? Electrical goods such as TVs and microwaves are always something that many people from the UK are keen to take with them when they start organising removals to Spain. Everyone likes familiarity, especially in a strange new country, so things from home that are well-used and understood are important. But will your electrical goods actually work in Spain? Or should you buy new items in the country when you get there? The good news is that yes, electrical items from the UK will generally work in Spain because, like everywhere in Europe, Spain�s electrical mains supply is 230v/50Hz. The difficulty comes in being able to plug your electrical items in after moving furniture to Spain. Spanish plug sockets only accept the European two pronged type of plug, whereas plugs from the UK have three prongs. One option is to buy adapters for every item before you move, but this can be expensive, and if you are moving permanently to Spain it is not a long term solution. For that you should have each of your plugs changed to a Spanish two pronged one. It will help in the long run. It�s worth noting that, if you use analogue TVs and equipment, you may have difficulties receiving a picture as the transmission system is different � upgrade to digital beforehand if necessary. 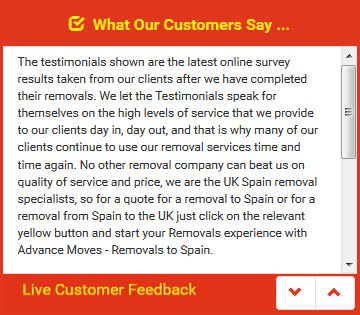 Furniture removal Spain is what Advance Moves does best. Our website is fully dedicated to ensuring you get the best deal � take a look http://www.advancemoves.com/. When you need a quote, please don�t hesitate to contact us on 0871 218 0612 or email info@advancemoves.com. We will provide everything you need for a smooth move.